Chimney sweeps in Portland Oregon are having to deal less and less with un-lined woodstove inserts. 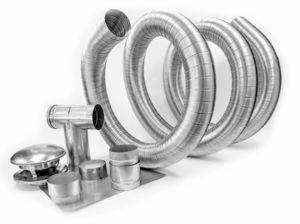 Back in the ancient days wood stove inserts ( a wood stove that has been set into an open fireplace ) were not installed with a stainless steel liner being installed down the length of the chimney, connecting to the wood stove itself. Of course, we do clean un-lined inserts and perform liner installations and masonry repairs. Call to schedule an appointment or estimate. (503) 653-3819. Cleaning an un-lined woodstove insert. Non-EPA certified woodstove removal requirements per Oregon law. Pre-fabricated fireplaces – repair or replace? Pre-fabricated fireplace repair/replacement. Fireplace damper repair- Fix it by having a top-closing damper installed! A 24-year veteran of the chimney repair trade, Cliff has experience in most phases of chimney construction and repair. He began as a chimney sweep apprentice in 1991. Two years later he began to educate himself in bricklaying and chimney construction. He claims that "it has been an interesting trade to say the least. Chimney rain cap installation-Increased demand for by our customers.